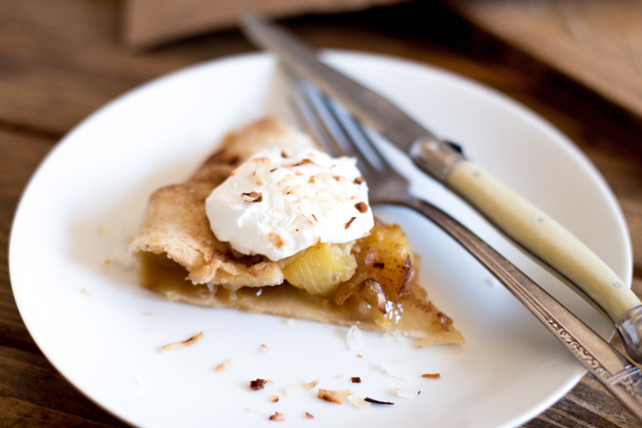 This easy pie gets its rustic look from a refrigerated pie crust—and its lusciousness from fresh pineapple and toasted coconut. Melt butter in medium skillet on medium-high heat. Add pineapple; cook 5 min., stirring occasionally. Stir in flour and brown sugar; cook 1 min. Remove from heat; stir in nuts. Unroll crust onto lightly floured surface; roll out into 12-inch circle. Transfer to baking sheet. Spoon pineapple mixture into centre of crust, spreading to within 2 inches of edge. Fold over edge to partially cover pineapple mixture. Sprinkle edge with combined granulated sugar and cinnamon. Bake 30 min. or until edges are golden brown. Serve topped with Cool Whip and coconut. Toasting coconut is easy. Just spread coconut evenly in shallow baking pan. Bake at 350°F for 7 to 10 min. or until lightly browned, stirring frequently. Or, spread in microwaveable pie plate. Microwave on HIGH 3 min. or until lightly browned, stirring every minute. Watch carefully as coconut can easily burn!